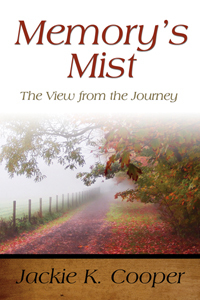 MEMEORY"S MIST is a collection of personal essays about life in the South as seen through the eyes of author Jackie K. Cooper. The stories contained hold up a mirror upon which the shared traits and experiences of life can be seen. Some of the experiences shared are humorous, some are sad, some are dramatic, and some are life affirming. Through them all runs a ribbon of hope and optimism. As Cooper reflects back on his past, the vision has been somewhat dimmed by the mist of memory but—with the help of family and friends—he is able to part the mist and have a clear view of the past which in many ways signals the future. As with his other books Cooper finds life full of surprises and simple joys amid the tumultuous and uncertain lives we all live. This title is available in e-book format at amazon.com and barnesandnoble.com.